Rocco contacted me about a new Disordered Records single co-released with Red Lounge records and I was glad to hear his Italian label still had a few tricks up it's sleeve since it's untimely demise (?) a while back. With a resume like Lost Sounds, River City Tanlines, Mouserocket, Ultracats, I have to say I wasn't expecting this kind of pop electronic slant on the A Side 'Can't keep my hands off u'. It's almost sounding like that Stephin Merritt side project, Future Bible Heroes. That same ultra pop, completely catchy sweet melody. Listen to the vocals and she's describing these scenes with 'dripping dirt and smelling sweat', there's something else a little sinister going on. I think that's where I get that Future Bible Heroes reference from. There's something a little rotten just under the surface. 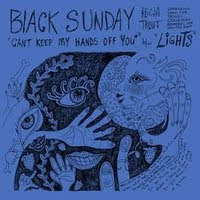 Black Sunday draws you in with this machine dance beat, layers of jumpy synth melody, all with those electronic piano type presets....but the whole 'can't keep my hands off u' chorus becomes something a little stalkery. This person might be up to no good actually, instead of a declaration of love. She might have to have her hands on you whether you like it or not. The B-Side 'Lights' is more of a rock and roll jam, with a real crunchy guitar sound, a little dirtier. With plenty of hammond organ chords banged along with with the kick drum. Again, it could be enjoyed as catchy and fun, but these 'lights' she's talking about are 'making her sick' and 'feel dead' meanwhile sung in bubbly layered harmonies, with a different tone than the A-Side, they're a little Breeders, kind of breathy, falsetto...true to the name it's going to be a Black Sunday. By the way she's also busy running her own label Contaminated records, where strangely this single isn't listed, but it might be worth dropping her a line over there, as it seems to have sold out from Goner and most other places. 7inch slam incidentally also had Alicja Trout over to make coconut ginger curry soup. Check it out.